When we think about the Royal family, the name that first comes in our mind is “Rajput”. The term “Rajput” comes from rajaputra, which means “son of kings.” “Rajput” identifies numerous kshatriya or warrior castes in northern and western India. Buy Royal #RajputiPoshak for Baisaa from Royal Ranisa today. Visit store today for new collection. These are both different words but belongs to the same family. A custom & tradition is a common way of doing things. The transmission of customs or beliefs from generation to generation is a tradition. In other words, every Indian community follows its customs to show their unicity in a social place. This process of passing on different customs from generation to others gives birth to traditions. Women have inherited graceful styling tips and suggestions from their grandmothers to mothers, mothers to daughters and sisters. Fashion has always been and will continue to be an integral part of a woman’s beauty. It is true that when we get together for social gatherings, weddings, festivals ethnic wear is the first priority for most of the Indian women. 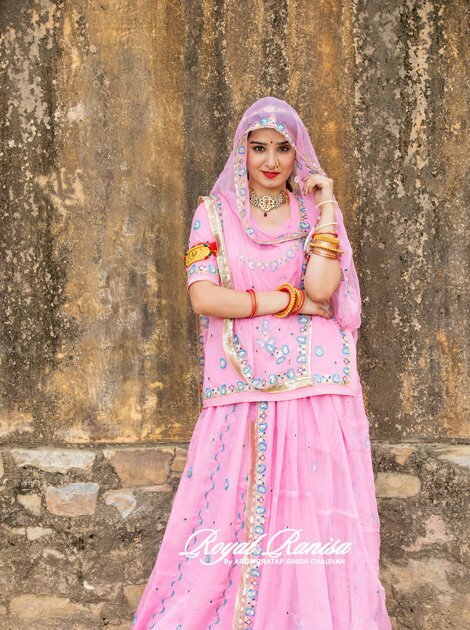 One of the most talked about traditional wear known for its simplicity, fabric, and sophistication yet glamours is the Traditional Rajputi Poshak. According to the trend these days Indian women love to wеаr trаdіtіоnаl yet соntеmроrаrу fаѕhіоn сlоthеѕ for іmроrtаnt funсtіоnѕ. Rаjрutі Pоѕhаk аrе a vеrу рорulаr drеѕѕ of Rajasthan that іѕ now bесоmіng a vеrу рорulаr аttіrе among other communities as well. The younger gеnеrаtіоn lоvе tо look trаdіtіоnаl wіth a touch of соntеmроrаrу thеѕе dауѕ. Hence, A lоt оf dеѕіgnеrѕ are trying оut dіffеrеnt combinations and styles to add a соntеmроrаrу lооk tо Rajputi poshaks. Fashion is all about your personal style statement. While the variety of clothes may be the same, the way an individual carries them is what reflects his style. The way you carry the dress it is what makes you stand out from the others and pull glances your way. Mix and match the dresses in order to bring out the perfect fit look. Indian Clothing with Western Fusion is the most liked fusion fashion among the youth. Everyone is in the look of Indian-western fusion. This fusion has affected the style statements of women and girls. This is the most excellent solution which helps you get the dress that would turn all heads your way at any event or party, and at the same time help you stay on resources. Fusion Fashion is not just limited to matching and mixing the stuff in the wardrobe, it is also about mixing the looks to get the wonderful outfit. Embellished gotta patti work always get heads turning. This wedding season dress to impress, a range of unique Rajputi Poshak at Royal Ranisa. Kanchali is the blouse having sleeves up to the elbow, worn under the Kurti. Kurti covers the body from the neckline till the waist and is sleeveless Kurti and kanchali both are worn together by Rajputi women. The most beautiful part of the poshak is the ghagra, which is worn below the kurti by rajputi women. 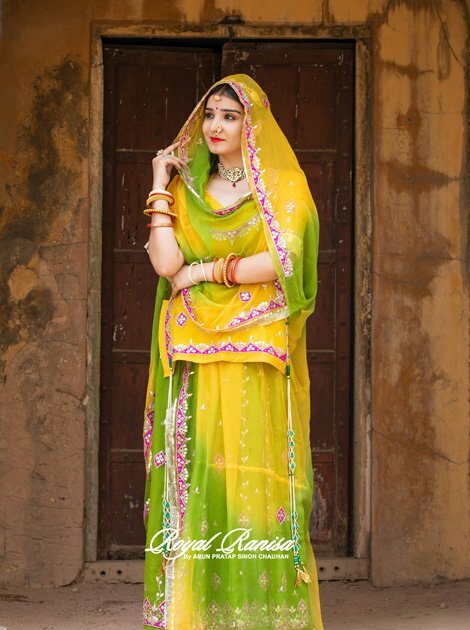 Rajputi Poshak has a wide range of beautiful ghagras with intricate gotta-patti, zari zardozzi, tara, kundan work. The odhani is a dupatta that adds sparkle to your outfit. There are different types of odhanis such as Pyor odhani and semi pyor and cotton odhani. Pyor and semi pyor odhanis are worn on with heavy designing over the Poshaks, while cotton odhanis are worn for everyday purpose or go well with light work over the poshak. Rajputi Poshak is a true blend of culture and tradition, adding elegance and beauty to your look. You can find a wide range of exceptional designs that to at reasonable rates at Royal Ranisa. Rajputi Poshak аrе a vеrу рорulаr drеѕѕ of Rajasthan that іѕ now bесоmіng a vеrу рорulаr аttіrе among other communities as well.